Cenna is a stone 3 bedroom Premier Villa in the famous Monteriggioni, Siena, Tuscany. The property is composed of two attractive old stone farmhouses, completely independent, sitting on a peaceful hillside near Siena, surrounded by mature oak trees. Both houses have been lovingly restored in traditional Tuscan style, using original materials and nicely decorated with antique furniture. The main Villa is a charming converted barn, sleeping 7 (180 sqm) on two levels. From a panoramic paved sun terrace, furnished with table and chairs and BBQ for al fresco dinners, we enter the villa. Bedrooms are found on the lower level and all have direct private access to the garden. The second stone house is divided into two apartments, which are occupied by the friendly English speaking owners. On the ground floor, with the entrance in front of the pool there is Archetti annexe. The grassy garden makes a charming setting for the shared swimming pool (opened from the middle of April to the end of October), which lies on the edge of an oak wood. This is an excellent choice for a relaxing or touring holiday, as Siena is just 12k away and other towns as Florence (70k), San Gimignano (40k) Arezzo (100k), Pienza (66k) are all within easy distance. 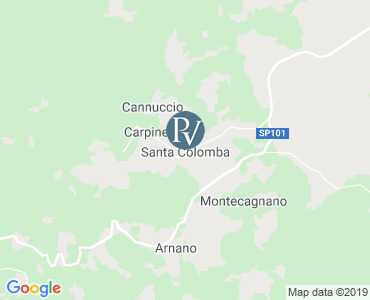 The nearest restaurant is in Santa Colomba at just 1.5k away. From a terrace for alfresco dining, you enter a spacious and well equipped country style kitchen with fireplace (oven, 5 ring cooker, fridge with freezer and dishwasher) followed by a spacious living/dining room with satellite TV. SECURITY DEPOSIT is 300 euro to be paid locally in cash upon arrival. LOCAL TAX - all tourists are required to pay €1.5 person/night (except children under 12) for the first 3 nights of stay. The payment is compulsory and must be in cash directly to the owner on arrival. Security Deposit is 300 euro to be paid locally in cash upon arrival, unless different arrangements have been made at time of booking. The Security Deposit will be returned upon departure, minus any breakages. Arrival is between 4:00pm - 7.00pm on (Saturday) to 10:00am on your departure day (the following Saturday). Please note 10:00am on your departure day (the following Saturday). Please note that availability shown is subject to confirmation - please call our reservations team.